Are you getting enough grass-fed butter in your diet? Grass-fed butter is a nutritional powerhouse, and unless you have a dairy allergy, I think you should be including it in your diet everyday. Not all of my meals lend themselves to being topped with butter, so I’ve developed a few candy-like recipes that make it easy to add some butter to the end of a meal or snack. 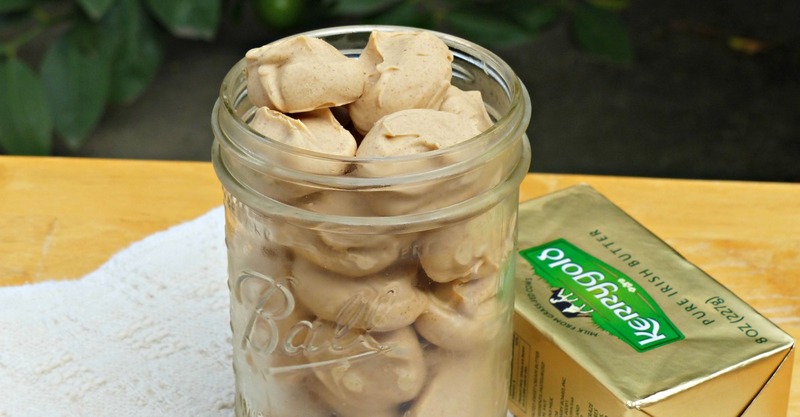 Flavorful, slightly sweet, and with a whipped taste vaguely reminiscent of frosting, these cinnamon butter bites are a delicious way to eat your healthy fats! Just pop one or two at the end of your meal, or even between meals if you feel like you need a little pick me up. They’re kid-friendly, too! Healthy fats like grass-fed butter are SO important for kids, but I personally struggled with getting much butter into my daughter when she was younger. She totally went for these butter bites, though! I have never done the keto diet, so I didn’t actually write this recipe to be keto-friendly. If YOU are on the keto diet, though, this recipe can definitely work for you. Instead of using the full amount of honey, replace some or all of the honey with your keto-friendly sweetener of choice. While you can use any butter for this recipe, you’ll get better nutrition as well as better flavor if you opt for grass-fed butter. Grass-fed butter comes from cows that are exclusively (or close to exclusively) fed grass–which is the ideal diet for a cow–and thus contains many more vitamins, minerals, and other nutrients than butter that comes from grain-fed cows. Depending on where you live, you may have several different varieties of grass-fed butter available to you. 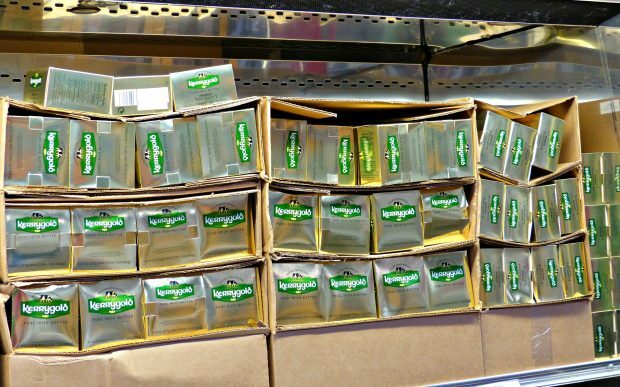 Personally I exclusively buy Kerrygold butter because I can get it at my local Costco for a very affordable price. If you’re not a Costco member, you can also find grass-fed butter at health food stores like Sprouts, Trader Joe’s or Whole Foods. Local grass-fed dairies also often sell grass-fed butter, although that option is likely to be more expensive. If you can afford it, raw grass-fed butter is the absolute BEST butter you can buy. Personally I don’t have that kind of leeway in my budget, but if you do, definitely go for it! I use salted butter in this recipe because my most affordable grass-fed butter option is buying salted Kerrygold butter at Costco. You can certainly substitute unsalted butter, just be sure to add some salt to taste. Looking for More Healthy Fat Recipes? If you want more ways to add healthy grass-fed butter to your diet, check out my recipes for grass-fed butter mints and chocolate butter bites. Watch Me Make Cinnamon Butter Fat Bombs! I made a video to show you just how EASY this recipe is! Click below to see me making a batch of cinnamon butter fat bombs. And if you’re into recipe videos like that one, be sure to come follow me on my Facebook page. I share tons of great real food videos! This recipe was inspired by the cinnamon kisses in the GAPS cookbook Internal Bliss. Allow butter to soften on your counter until it is slightly squishy. Add butter, cinnamon, honey/stevia, and vanilla extract to your food processor. Process for a couple of minutes to mix ingredients and achieve slightly whipped taste. Stop food processor as necessary to scrape down the bowl and reincorporate ingredients. Freeze for an hour or two, then remove from parchment paper or molds and store in a container in your freezer. Enjoy! This recipe sounds sooo good. Can I use a blender to mix the butter and other ingredients or is it necessary to use the food processor? Carolyn, I've never tried a blender so I'm not sure. I'm guessing that it would work, although you might have some trouble scraping it all out. I love my blender for liquidy things like smoothies but for thicker items I prefer the food processor because I personally find it easier to scrape. If you give it a try in the blender, come back and let us know how it turned out! I used a hand mixer. Turned out really delish! Wow, yum! I made a single serving with 3 tablespoons better, 1 heaping tablespoon granular swerve, 1/4-1/2 tsp pure vanilla extract, and 1/4 tsp cinnamon, mixed it in a small cereal bowl until creamy then ate immediately! 33g of fat later! Thanks! Thx for the smaller recipe without honey. I didn’t want to try the huge one until I decided if I liked it. Going to make it now! I also just added a couple of drops of chocolate stevia. But I like things sweet. YUMMY!!! I could eat this by the pound! It looks really tasty. I will have to give these a try. When I am feeling low on my fat quotient for the day I often find myself sticking my finger in the butter dish. These seem much tastier! Wow! This was not what I expected when I first saw the title. My son, who loves to eat butter straight from the stick, would LOVE these! Thanks for sharing at the Living Green Link-up! So simple and a great snack idea! Thanks for sharing it at Scratch Cookin' Tuesday! Now my husband is REALLY going to think my butter eating is out of hand. These look so good! Interesting but I couldn't finish reading the recip as the share thing was too irritating. Ghee is just clarified butter, I would imagine that you just prepare it the same way. No? Hi Cheryl, Yes, you can prepare it the same way, although you may need to adjust the other ingredients for flavor. In my experience ghee has a much stronger flavor than butter, so you may want to add more cinnamon and/or vanilla. Anyone know the Nutrition info for these? ?Trying to plug into My Fitness Pal. Is there a honey substitute to make this keto friendly? Yes, you can substitute stevia to taste! I love love love Xyla! and also, there is Monk fruit. I use half the honey, make the servings 16 and they come in at 120 cal and 4.7 carbs. Ketolicious! Do you know the nutritional facts per serving? No, I don't. I'm sure you could calculate them yourself, though! No, I haven't calculated those. I'm sure you could look it up, though! Is that using honey or another sweetener? That doesn't compute because for the 1/4 cup of honey alone, there are ~70 gm of carbs so divide that by 30 serves gives you 2.3 gm for one serve just of honey. I know that you suggest a food processor, but if I mix the ingredients by hand will it still turn out well? I'm not sure, I've never tried that. I'd be worried that you wouldn't be able to mix everything completely, but certainly give it a try and see! Can you have honey on Keto I thought you weren’t suppose to??? Rochelle, I'm not sure whether you can have honey on keto. (I didn't actually write this recipe to be a keto recipe, and I've never done the diet myself.) But feel free to substitute any other sweetener of your choice. Is this really supposed to be a pound? Honey normally isn’t a Keto ingredient...? Any reason that the butter can’t be heated until liquid, mix all ingredients and pour in molds? Do they not blend well into melted butter? I love these. I did substitute stevia instead of honey. They are great in the morning with my coffee. If you do not have a food processor, put all the ingredients into a ziplock bag, then put it in a bowl of hot water to soften up the butter and then mix by hand. Place the bag in the freezer after mixed for a few minutes to help re-solidify the mixture just enough so you can cut a corner off and squeeze it like a cake decorator!